C&C Seminary exists to equip men and women to press the crown rights of King Jesus into every area of life. It’s no secret: education is expensive and because of that fact, it’s increasingly less accessible, too. Cross & Crown Church knows that you can’t beat something with nothing, which is why we’ve created this seminary to address the growing problems in the educational industry. The word “seminary” comes from the Latin word for “seed.” It’s the idea of planting something in anticipation of growth. Our hope is to plant the biblical worldview, so that outward growth will tangibly affect your corner of the garden-world. 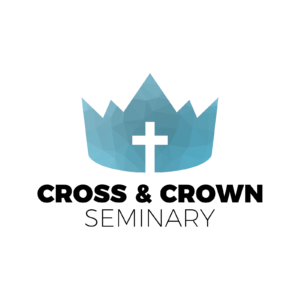 HOW IS CROSS & CROWN SEMINARY DIFFERENT? For far too long, “Seminary” has been strictly for the professional clergy class, but we believe that education belongs to all people in the church, so don’t let the word scare you. This is an all-encompassing discipleship program with guided learning and helpful mentoring for everyone. C&C Seminary was designed for both recently graduated college students and busy fulltime working men and women in mind. While the program was designed to be both rigorous and thorough in reading and writing requirements, it is also completely manageable for the serious student as you will be working through only one course at a time and have the encouragement and accountability of 1-on-1 mentorship. The program is flexible and very affordable! You pay a small monthly subscription fee for as long as you are enrolled in the program. In order to graduate from the program you will have to complete all course requirements, however, should life get busy and you need to take off for a month or two, you can put your subscription on hold and then pick right back up where you left off. The program consists of 11 carefully constructed modules, each building on the other. We anticipate you finishing the entire program in 24 months. • Read all required books. • Read all assigned Scripture Readings. • Listen to all required lectures. • Purchase the Topical Memory System and utilize the program for Scripture memory throughout your studies. • Attend monthly mentor meetings for discussion on progress, discipleship, sanctification, and dominion (video chat or in person). Education should be affordable, which requires free market solutions and creativity (that costs money). You need quality, which requires someone’s time and effort. You need accountability: people invest money in things that matter, and that investment demands your attention. Mentorship and counsel is valuable for growth. Because the Kingdom matters and Jesus cares about economic productivity. Gary North once said, “anything that can be done profitably should be done profitably.” We agree. For this program, you’ll work with our primary teacher, Pastor Jason Garwood (B.S., M.Div., Th.D. ), and he will guide you along each month as you’re learning. You can ask questions and receive guidance. This is less of a ‘teacher/student’ relationship and more of a ‘mentor/disciple’ relationship. It really is a unique approach! C&C Seminary is not accredited, at least not in the normal use/sense of the word. Our standards are high, and we believe the quality to be self-evident, without the need for state approval. That said, upon fulfillment of the program’s requirements you will receive a certificate of completion. For those in “full-time” Christian ministry, a written recommendation will be given from your mentor regarding your theological competency and spiritual maturity in so far as it has been demonstrated throughout the course of the program and the mentorship relationship. Perhaps the most important thing you will receive is the confidence and grounding to apply the law-word of God to every area of life and calling whether as a businessman, a mother, a teacher, an elder, etc. ***Please note that we have partnered with the Chalcedon Foundation to offer our students a very generous discount on all required Chalcedon textbooks purchased through the Chalcedon store!